If you’re a February baby, then you’re not only born into the month of love, but you’ve got one of the most popular and highly valued stones of the quartz group to your name. Its name comes from the Greek ‘methustos’ meaning intoxicated, which is why it is known as the ‘sobriety stone’ as it was believed that it would prevent drunkenness (all those people that gave up alcohol for January, this one was a good one to help you stay away from the wine! ), as well as any other addictions or obsessions, so a good one to slay those demons (and keep me away from that chocolate cake). 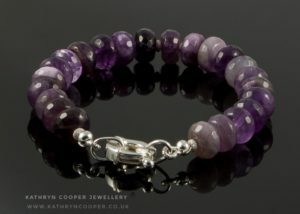 The amethyst is a beautiful transparent purple quartz, although the colours do range from a pale lilac to a deep purple. If you’re in possession of a reddish purple hue, then you’re in luck, as this shade is the most valuable. You can also find green amethysts, also known as Prasiolite. These little beauties have the same properties as purple amethyst, with the addition that they increase a sense of compassion and self-love. So perfect to treat yourself to, and I do have some stunning green ones available for commission pieces, so contact me if you would like something bespoke. One of the reasons why amethyst is so popular is that it covers all bases where gemstones are concerned. It’s a stone with one of the widest range of powers, so you can’t go far wrong with this one. It’s known as a stone of the mind and creates clarity of thought; Leonardo Da Vinci was a fan, he thought it could dispel evil thoughts and increase intelligence (it obviously worked for him). In addition, it’s a meditative and calming stone, providing balance, patience and peace. I’ve read that it has a gently sedative energy, which is a great way to describe its powers to provide contentment and emotional stability. So it can also be used at times of stress or grief, as it will help to heal. It is thought to increase spirituality and enhance intuition and psychic powers of all kinds, so along with my turquoise, I’m going to have it to hand when I choose my Lottery numbers! So, if you’re going to get only one gemstone, then I would recommend this is the one to get. Not only is it really pretty, its all-purpose properties make it very desirable. So head on over to my shop, I’ve added some new amethyst creations for you to have a browse. If you can’t see anything you like, let me know, and we can come up with something together.